This Shaker Chest of Drawers was strongly influenced by the Shaker style of furniture started by Mother Mary Lee. 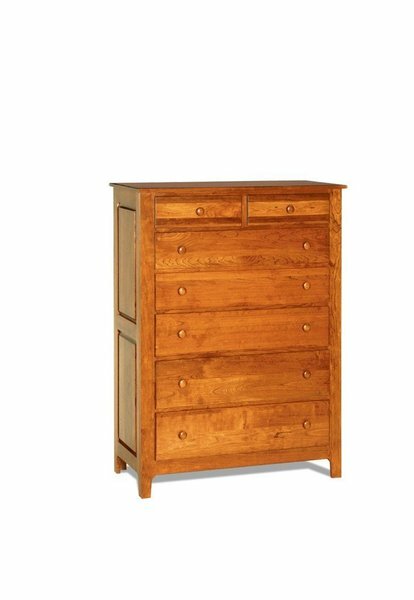 Our Amish handcrafted Chest of Drawers has clean, simple and understated lines. This chest of drawers will be the perfect complement to our Shaker Panel Bed , Shaker Pencil Post Bed or our more colonial styled Shaker Windsor Bed. This Shaker Chest of Drawers is sleek and sturdy with raised panel sides, wooden Shaker hardware and drawers that show off the solid wood grain. The drawers are dovetailed for years of everyday use. Choose to have this chest of drawers custom made from red oak wood or cherry wood or call in for pricing on custom woods such as maple. We offer a wide variety of finish samples including an organic tung oil. If you are matching this chest of drawers to exisiting bedroom furniture we are happy to do a custom stain match. Just this past week we received our bedroom furniture- it was not as it was described to be- it was much more beautiful and gorgeous than we expected! We want to thank you a thousand times over for your very helpful customer service, for always replying to us quickly, and for the great bedroom furniture. We requested a custom-made bed which was built only from a picture- and it's better than the picture we sent! We also requested a lot of little customizations to be made to our furniture- all of which was done for us. Please thank the builder for us, he did a fantastic job. We also requested the in-house delivery service from Gary. He was on time, courteous, and, even though he had another delivery to be made that night, helped assemble our bed for us- we were extremely pleased with his service and highly recommend him. A very-sincere thank you from a satisfied customer- be assured we will recommend JMX to all our friends and family! Just wanted to thank you and Katie... Katie got right back to us and was able to find us a great deal for the in-house delivery. We continue to experience great service from all of you and highly recommend you to all our friends! Here are the pictures at long last! Again, we love the Shaker bedroom furniture and look forward to using it for many years to come!